Drones For Better Real Estate Advertising! There are so many different ways to advertise your Real Estate business. We all know the “main stay” ways of doing this, that we do here at The Group Real Estate. Taking beautiful pictures. The 3D virtual scans of Matterport. Doing different staging techniques, to truly bring out the best of the home you are about to sell. Making sure that you have the best write up on the property, the home, and all of it’s features. One of the other options that is really starting to take off, is drone videos. Having a drone to take pictures and videos from great heights, from great angles, etc. One of the reasons that people love to utilize the 3D virtual touring of Matterport, is it allows their clients, and potential clients, to take a walk through of the listing. One of the best ways to highlight the home, from different angles, is using a drone. You are utilizing an even better way of using photography. You can utilize the drone by flying down from 200 feet in the air, swooping through details of the property in much dramatic form, with swooping angles and flying 2 feet away from the door, pulling out and up to highlight the great feeling of the home. Not only do drone videos highlight the outside of the house, with these great angles and sweeping shots of the home, you also have the ability to go through the home in a walk-through fashion with hand held, gliding cameras. This gives the feeling of walking through the home. We know the successes of using the 3D Touring as a walk through, now, using gliding cameras, you have the ability to “walk through” the home as if you were there. The gliding cameras can highlight parts of the home that even the Matterport can’t. We can make sure to highlight the cupboards, Lazy Susan’s, and walk through closets. 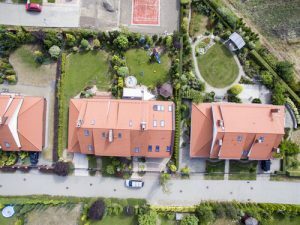 According to bestdroneforthejob.com, these are the 6 benefits of using drones to market your Real Estate. Creating more dramatic and compelling images. Using a modern ready-to-fly camera drone, you can create dramatic shots very easily (almost on auto pilot) by combining GPS programmed flight paths with automatic point of interest camera targeting. You are able to generate a sense of awe and interest that you simply can’t get from ground-based photos. Creating more interesting virtual tours. A drone can literally fly right into the front door. It can travel throughout ever single room of the home, and can make the experience far more natural this way. Using a wonderful voice-over track, virtual tours can become beautiful visual stories, proclaiming information and history of the home. Highlight more property features. If the home that you are taking photos of has certain property features, such as landscaping, pools, walking paths and back yards, the drone videos will help you in this avenue. Also, nearby parks and schools can be highlighted by drones videos and footage. This will help you generate new business. When you use drone videos as a big part of your marketing, you will bring in more business to yourself. Showing that you are willing to move forward and use technological advances, such as drone videos, it shows you want to bring the very best for your client. Saving money. Knowing that shooting pictures, and videos, from above can be expensive, if you hire helicopter or a fixed wing aircraft, photographers to do so. Using the drone, someone who knows how to fly the drone, you will be saving money in the long run. Hearing this come from the President of the NAR, we see that the support from the NAR is really putting forth so much effort so that drone footage of homes will become a main staple in the way that we market homes in the Real Estate community. This sounding advice and backing is the perfect phrasing for why you should be using drones to help sell your homes. It is the best compliment you can give to your clients. Greetings! Very helpful adfice within this post!